So while making the Data Analyze section for the Bots, we realized that we are lacking an important metric for the Bots i.e. the Goal of the Bot. Goal is something that you want your bot to achieve in the conversation. In a Lead generation bot, this could mean collecting the user's phone number. 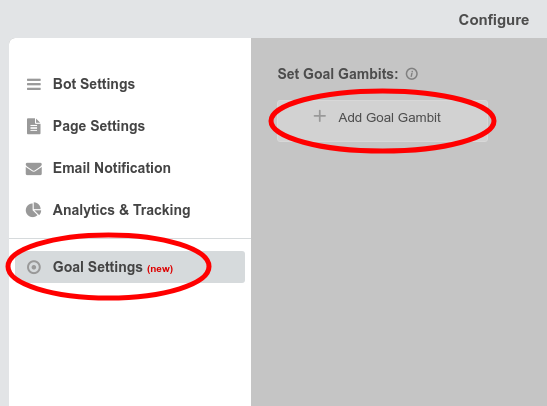 In a feedback collection bot, this could be user giving the final feedback etc..
Goal can be set in the Configure section of the Bot by selecting one or more Goal Gambits. 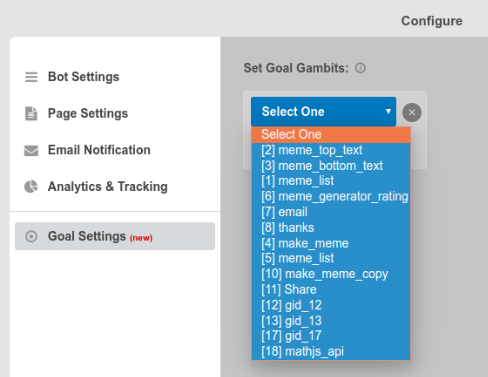 If the user responds to any of the Goal Gambits that you have selected, the Goal for the Bot is achieved and it is counted in the calculation of Bot Goal Completions and Goal Conversion Rate in Data Analyze section. Once you make any changes in the Goal Settings and save the configuration. You will be able to see the Values for Bot Goal Completions and Goal Conversion Rate in the Data Analyze section. These values will be 0 if Goal has not been defined, and will change when the Goal is changed. Note: Bot Goal Settings is used for Data Analysis and calculation of the Metrics in the Data Analyze section. It does NOT have any affect on the Bot conversation itself.